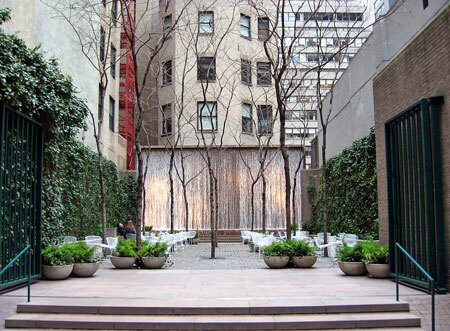 Paley Park is a small “pocket park” located on 1/10th of an acre on East 53rd Street in Midtown Manhattan. The park is often pointed out as an excellent example of park design and has been described as an urban oasis. Park visitors describe the space as serene, peaceful, and relaxing, which is quite an accomplishment for a tiny spot in the middle of Manhattan. The focal point of the park is a 20 foot waterfall that cascades over the back wall. The side walls are covered with ivy, wrapping the park in green and helping to create a cool, quiet atmosphere. The park, designed by the landscape architecture firm of Zion Breen Richardson Associates, opened in May of 1967. Paley Park was featured in William H. Whyte’s The Social Life of Small Urban Places, with a discussion of how well the park functions as a social space. The honey locust trees selected for the park provide shade, yet have a thin enough canopy that they allow dappled light to enter the park. Read comments from Paley Park visitors. Paley Park is located at 3 East 53rd Street, between Madison and Fifth Avenues.